18+, 40x casino wagering required before withdrawal (game weighting applies), 2 day expiry for bonuses, Max bet 6.25 until wagering requirement completed, T&Cs apply, New players only, Min deposit £10. All our partner sites are independently reviewed by our team of industry experts. We examine 10 different criteria and award a score out of 10 for each, adding up to a final mark out of 100. You can read a full description of our Casino of Dreams review process here. Casino of Dreams received a score of 84/100. 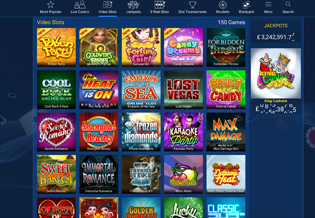 Casino of Dreams is an online casino powered by Microgaming and owned and operated by Broadway Gaming Ltd, a Malta-based gaming company who are known for their bingo brands, Butlers Bingo and Dotty Bingo. Casino of Dreams launched in 2015 and is licensed and regulated by the UK Gambling Commission and the Maltese Gaming Authority. Fans of Microgaming titles – games like the legendary Thunderstruck 2 and Immortal Romance – and a quality live casino experience – will love Casino of Dreams. There’s plenty on offer here to keep you happy for many hours. But of course, if you’re looking for a wider selection of titles from a variety of game suppliers, they you may be better off looking elsewhere. The wagering requirement is set at 40x the bonus amount and no withdrawal can be made until this wagering requirement has been met. Note also that slots games contribute 100% towards your wagering requirements, Roulette, Blackjack and Video Poker contribute 8%, but all other games make no contribution. Casino of Dreams game catalogue is limited only to titles from the Microgaming stable. But don’t let that put you off. Even a quick glance down the slots list reminds us of what a great selection of entertaining games this company has brought us over the years. For evidence, just check out Jungle Jim Eldorado, Lost Vegas, Dim Sum Win Sum, Mega Moolah, Immortal Romance and Thunderstruck 2, sitting alongside newer games Candy Dreams, Fortune Girl and Goldwyn’s Fairies. One of the strengths of Microgaming as a game provider is the sheer volume of titles they bring out each year, and with great variety too. So whether you’re a small spender looking for a quick bite of a low volatility game, or a high roller out for that big cash win, there’s something for everyone here. So don’t worry that your favourite NetEnt or NextGen titles are not in the listings, because re-visiting old classics or seeking out a new favourite from Microgaming can still be a real treat. A particular draw for slots players looking to chase the big jackpots will be the Progressives tab at Casino of Dreams. Amongst the multi-million pound games available to try your luck on here are Mega Moolah and Mega Moolah Isis, King Cashalot and Major Millions. Plus there are smaller games to choose from like Cash Splash, Fruit Fiesta and Lots a Loot. If table games are more your bag, then you can take your pick from 7 different versions of Roulette, including Multi Wheel and American and European versions. Or for Blackjack players there are 14 different versions of the game, including an Atlantic City Multihand format and a Europeran Multihand format. And whilst Video Poker has been sidelined in many online casinos, here there is still a big variety of the popular US game on offer. Titles include Aces and Faces Power Poker, All American Poker and Jacks of Better Poker. There are 23 different Video Poker formats in total at Casino of Dreams. Still need more? Well if all that hard gambling gets to you, there is always the Casual Games lobby where you can play versions of Flip Card, Pharaoh Bingo and Super Bonus Bingo. The stakes here are lower and the action a little less frenetic. Onto the Live Casino then – and there are versions of Baccarat, Blackjack, Roulette, French Roulette, 3 Card Poker, and Caribbean Stud to choose from. Microgaming, perhaps best known for their slots games, have greatly improved their Live Dealer suite in recent years, building new games on their Quickfire Platform, and they are now a worthy competitor to Playtech, NetEnt and Evolution in this field. The dealers are friendly and the video and sound quality are excellent, creating a truly immersive experience for players. Casino of Dreams have developed a loyalty club for players with five levels. Higher levels bring bigger rewards, but you have to earn your upgrades with regular deposits and wagering throughout your lifetime at the casino. So, starting off you will automatically be entered into level 1 where you receive a daily mystery prize of loyalty points, free spins and deposit bonuses. There is no explicit information on how you earn your upgrades to levels 2 to 5, though of course a regular spend is the surefire way to achieve this. Other gifts and promotions available through the club include Bonus Money, with tiered deposit bonuses, Free Spins Thursday – where a £20 deposit will earn you free spins on the slots – and various slots tournaments throughout the month. Casino of Dreams offers up a reliable set of regular payment options for their cashier. Standard debit and credit card options include Visa, Maestro, Solo and Switch. Alternatively, online solutions Neteller, Paysafecard and Skrill can be used. There is a minimum deposit amount of £10 set for first deposit, and £20 thereafter. The minium withdrawal is £20, and the maximum monthly withdrawal aside from progressive jackpot wins is £20,000. 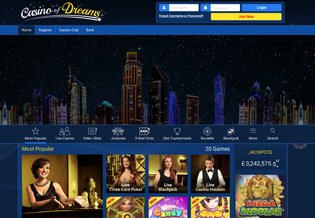 Casino of Dreams is well presented and offers easy access to all games from the home screen. For new customers who want to browse before signing up, it’s easy to look through the games which are well arranged into easy sections, with a ‘Search’ function allowing players to find a game more quickly. Sign up proves to be quick and easy, and from there access to primary functions of cashier, games and customer support is nice and simple. Casino of Dreams serves customers through Live Chat Support 24/7 throughout the year. You can access the chat from the Support link at the foot of the page. Otherwise, email the team at support@casinoofdreams.com. There is no telephone option. Casino of Dreams has been optimised for customers who want to try the games on all devices except Blackberry. The transition from desktop to mobile or tablet is well handled and playing on any platform is enjoyable at Casino of Dreams. The Maltese Gaming Authority and the UK Gambling Commission provide license and regulation for Casino of Dreams. This provides a sounds level of comfort over security, fairness and trust for customers. * 18+, 40x casino wagering required before withdrawal (game weighting applies), 2 day expiry for bonuses, Max bet 6.25 until wagering requirement completed, T&Cs apply, New players only, Min deposit £10.